Okay - no more pictures of my bald head... But thanks for all the compliments! I am really surprised at how easily I am adjusting to it. My husband is definitely supportive which really helps. We are even able to joke about it. I am not one to dress up for Halloween but just the other day I had a thought. My new bald look gives me all kinds of options for dressing up this Halloween! 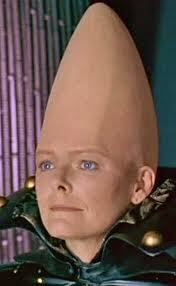 I could be a cone head a la Jane Curtin or some kind of alien and paint my face green. I could open the door and shout 'Take me to your leader!'" That would really get a reaction from the kids, I'm sure. Then my husband chimed in and said we should dress up as Addams Family characters. I could be "Aunt Fester" and he could be "Lurch." 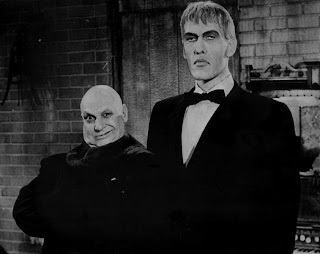 My husband would make a great Lurch -- opening the door and staring at the kids and grunting. Perfect! But I know us... we won't dress up. We don't even get that many kids on Halloween. But at least we can joke about it! I love Jane Curtin and love you too! But go ahead and buy Halloween candy anyway!